My holiday weekend was spent in Tennessee at my Mom's house. I had a very nice, but too short visit. I of course took my camera and here are just some random pictures from the weekend. I gave this painting to my Mom a few years ago and it's one of my favs. I found it at the most fabulous store on the planet, Black Eyed Susan's in Fair Haven, NJ. The owner, Susan became a dear friend. Just a pretty place in my Mom's house, behind the sofa. The quilt is a family piece. This birdhouse was created and all hand-painted by my sister. 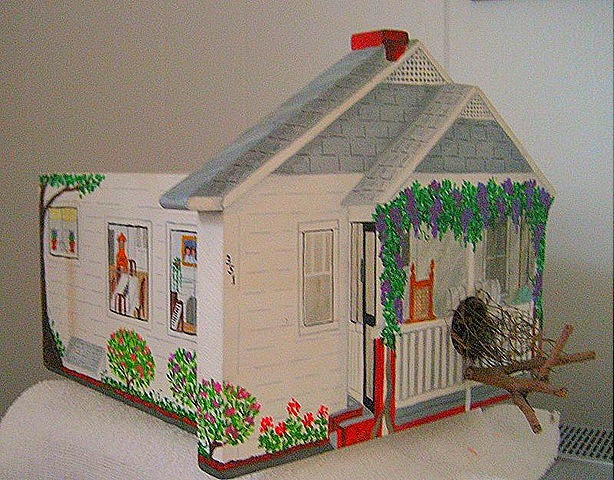 It is a replica of my grandparent's house in Hapeville, GA. She got all the details exact, the rocking chair on the porch and you can see the different rooms just as they were furnished by looking in the windows. Downtown Bristol, VA. I've got a thing for old signs. The Burger Bar is still open! 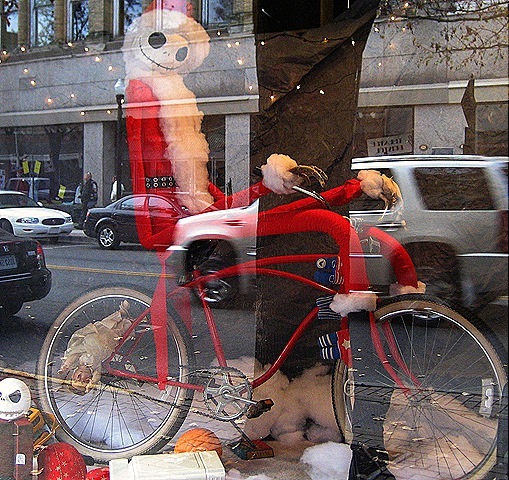 I thought this was a creative window display, note the cracked head dolly in the spokes. The little chairs are just too sweet and that birdhouse….amazing! I love the quilt at your moms. What a great display…tell your mom it is very pretty. I also think the Christmas display is cute in a creapy sort of way! Lovely decor at your Mom’s! Love all the chairs at your mom’s! And the hollyhock picture is beautiful! I love the window display and I have a thing about old signs, too. I am always wanting my hubby to stop and let me take pictures when we are traveling. He can’t stop every time! lol I LOVE your new banner! Would you tell us more about your reindeer? I am so interested! Oh Suzy, you KNOW I love the quilt behind her couch! A woman after my own heart! 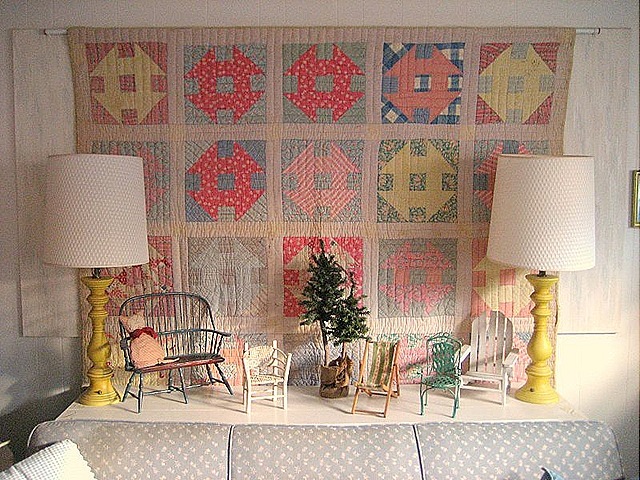 Love the quilt and those sweet little chairs in your mom’s house! Love the new banner!! Especially the Diva deer with her tongue out!! Your moms house is wonderful. Glad to hear that you had a good holiday. I thought that I recognized that painting. You have such a good eye for spotting the fun and cool(window and sign). I don’t know how this happened…but I wrote this comment. I came back to see if you had written anything about your banner reindeer and it appears to have someone else’s name….?? Well, I am a complete goof ball this morning and now I see my comment! lol Will you delete at least one of them? THANKS! ROFL!!! I live in Abingdon which is very close to Bristol. 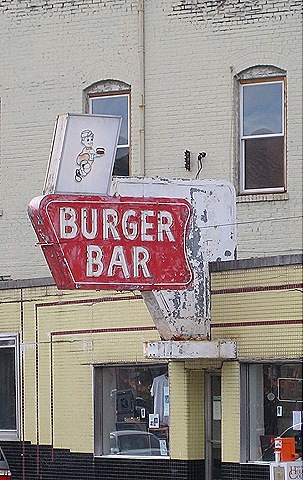 I was surprised to see your photo of the old Bristol Burger Bar on your site. I enjoy looking at your creations; the purse made with the vintage Christmas fabric is my favorite item.